The American Academy of Pediatrics (AAP) believes that every child deserves a medical home, where care is accessible, continuous, comprehensive, patient- and family-centered, coordinated, compassionate, and culturally effective (www.infanthearing.org/medicalhome). The “medical home” physician is a critical member of the team determining effective services for children who are hard of hearing or deaf (HH/D). This responsibility is a multi-faceted, complex, and delicate undertaking that requires knowledge and skills for which virtually no training is provided in medical school (Moeller, White, and Shisler; 2006). Deciding how to provide such services is complicated by the high degree of heterogeneity of children who are HH/D. The primary care physician must consider differences in variables such as the family’s ethnicity, education, religious and cultural beliefs, and family structure; but also the child’s hearing loss, hearing status of the parents, and parents’ choices for communication modalities, which all can powerfully affect how to best provide services. How Well Does the Child Hear? Congenital hearing loss ranges from mild unilateral loss to bilateral profound hearing loss. 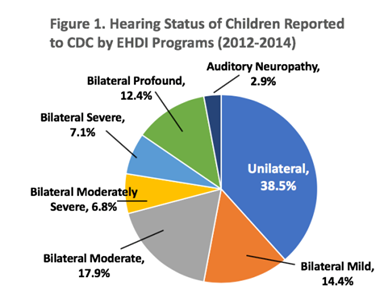 All childhood hearing loss, regardless of the degree, has developmental consequences as noted by the Department of Health and Human Services in their landmark document establishing National Health Promotion and Disease Promotion Objectives in 1990. The needs of a child with unilateral hearing loss are certainly different than children with bilateral hearing losses; however, all children who are HH/D need assistance if they are to reach their full potential. In Oklahoma, a unilateral or bilateral hearing loss of 25dBHL or greater is an automatic qualifier for early intervention services through SoonerStart. Lieu JEC. (2018). Permanent Unilateral Hearing Loss (UHL) and Childhood Development. Current Otorhinolaryngology Reports. 6 (1), 74–81. Moeller MP, White KR, & Shisler L (2006). Primary care physicians’ knowledge, attitudes and practices related to newborn hearing screening. Pediatrics. 118, 1357-1370. U.S. Department of Health and Human Services. (1990). Healthy People 2000: National health promotion and disease prevention objectives. Washington, DC: Public Health Service.